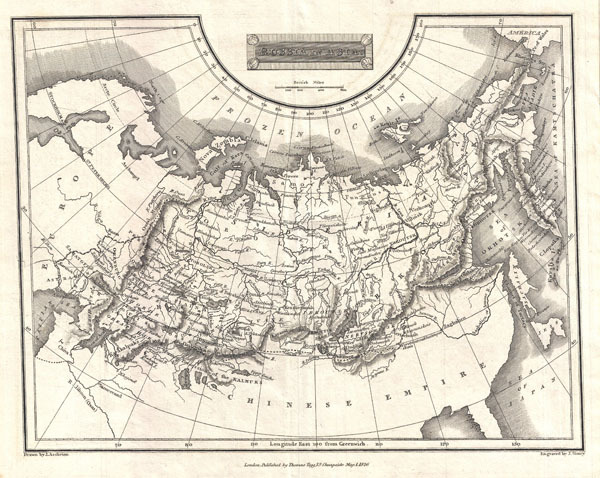 This is a fine 1826 map of Russia in Asia, drawn by J. Assheton and engraved by J. Shury. This beautifully drawn black and white map covers the entire area of Russia and the adjacent parts of the Chinese Empire. Makes note of numerous rivers, mountain ranges, gulfs, seas, and major cities. Scale is shown in the upper center quadrant. Published by Thomas Tegg of 73 Cheapside, London.